In 2013, the Malaysia Good Mark Design Award only endorses new product that excels in design concept, flawless design engineering and application. 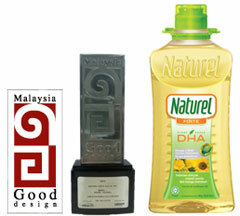 The superior packaging design in Naturel Forte DHA Cooking Oil received recognition from the Malaysia Design Council. Lam Soon Edible Oils Sdn Bhd is the only recipient of the award from the FMCG food industry.